a&o Hamburg Hauptbahnhof i Hamburg, Tyskland : Boka nu! The building of the a&o Hamburg Hauptbahnhof is characterized by the typical hanseatic architecture with a red brick fassade that fits seamlessly in the cityscape. 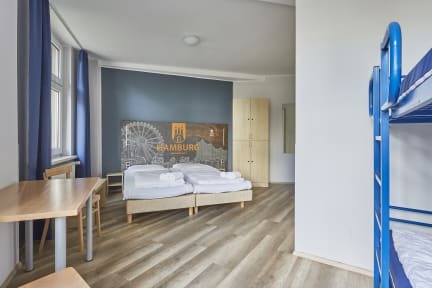 In addition to the modern rooms, the centrally located a&o Hamburg Hauptbahnhof also offers a large dapper lobby and an ASTRA bar with a party cellar both exuding a historical charm. The house has both hotel and hostel rooms, which are located on separate floors. For individual and business travelers we have single and double rooms available. All rooms are light and have modern furnishings. They are each equipped with a shower, WC and television. Our family rooms are a good choice for parents with two children. The hostel offers good deals on bigger multi- bed rooms, good value and affordable accommodation for big groups. At reception you will find WiFi internet access or internet terminals and a souvenir shop. We have friendly and competent staff that is always happy to help you with planning mini excursions or booking theatre tickets. In our spacious and comfortable Premiere Sports bar you can lose track of time. Nothing to complain about except that the lockers in the room we had was broken and we therefore had to pay to use the lockers in the lobby. Over all, the hostel was good and the people working there were nice. Not too far from the central station. Dyrt fyrbäddsrum som vi fick boka med kort varsel. Låg 20 minuter till fots från stationen men i ett tråkigt område. Take another hostel if you can! 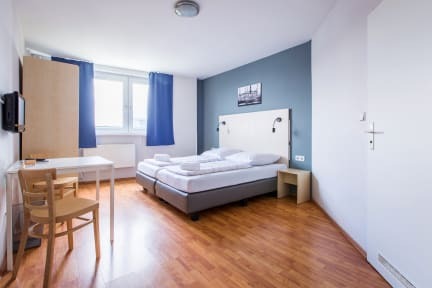 Of all the 12 hostels we’ve been at not a single one took a fee for the sheets, there were no lockers in the room except for a few in the lobby which were quite expensive. We payed for the sheets and when we were making the bed we noticed dirty footprints on the pillowcase, so we tried to exchange them for new ones, but they were in the same state. Staff was not very helpful. Overall not a great experience!